No matter how algae free we keep our tanks... over time the pristine glass lily pipes will eventually be covered in algae. 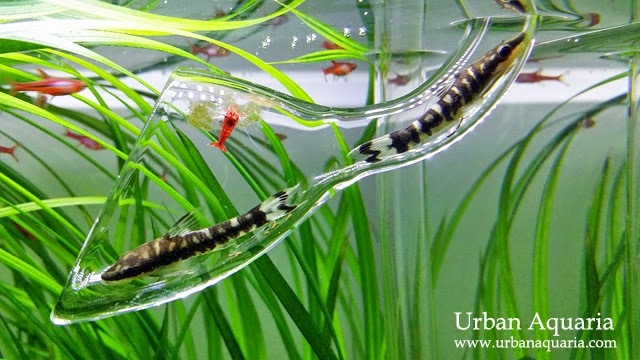 Algae eaters like shrimps, otocinclus and snails aren't able to access and clean it properly as the filter is constantly in operation. I gradually discovered that whenever i switch off my canister filters for a few minutes while feeding the fishes, the cherry shrimps and otocinclus always try to rush into the glass lily outflow pipe and munch on the algae accumulated there. The video was originally around 7 minutes long, but i sped it up by 5x to give an accelerated view of how the glass lily pipe is cleaned. Observe how the shrimp at the top of the glass lily pipe consumes the green algae. There was once i stepped out of the room for a while and when i returned a few minutes later, one of the otocinclus actually made it past the top bend of the glass lily pipe, and it was busy eating algae all the way down the hose into the canister filter! I had to eventually disconnect the outflow hose just to rescue it. BTW, I'm curious what are the red-colored fishes swimming in the background? Although the shrimps and otocinclus help clean the glass lily pipe, there will always still be some residual algae left on it... so i just disconnect the hoses and clean it manually with a flexible pipe brush as part of regular tank maintenance. Just a suggestion: prepare a small wad of filter pad or a piece of netting from an old broken net and stuff it into the neck of the lily pipe after you turn off the filter. Thats a great idea, thanks! Its best to leave the filter on 24/7 as switching it off for long periods of time will cause the beneficial bacteria inside to be starved of oxygen and die, which will in turn mess up and reset your tank cycle each time. I use external Eheim canister filters for most of my tanks. They are silent, don't take up tank space and don't transfer heat or vibrations into the tank (compared to internal filters). There are also taps on the filter outflows which i can adjust lower to reduce the overall current when required. If your fishes are having difficulty swimming due to the strong filter current, you'll need to reduce the filter flow by adjusting the output tap (if available), or redirecting the outflow towards the glass or higher towards the surface, or adding objects like wood/rocks to block and dissipate the outflow. Just have to try various methods and see which work best for your setup. That was amazing! Really good quality!